A 150-million-year old ‘Dinobird’ fossil, long thought to contain nothing but fossilized bone and rock, has been hiding remnants of the animal's original chemistry, according to new research. 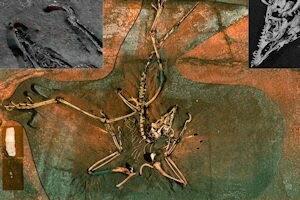 The sensational discovery by an international team of palaeontologists, geochemists and physicists was made after carrying out state-of-the art analysis of one the world’s most important fossils - the half-dinosaur/half-bird species called Archaeopteryx. The discovery could revolutionize the field of palaeontology say the team led by scientists at The University of Manchester and the Department of Energy's SLAC National Accelerator Laboratory in the United States. By recording how ‘bright X-rays’ interacted with the fossil, the team have created maps showing chemical elements which were part of the living animal itself. The maps, published today in the journal Proceedings of National Academy of Science, show that portions of the feathers are not merely impressions of long-decomposed organic material—as was previously believed. Instead, they include fossilized fragments of actual feathers containing phosphorous and sulfur, elements that compose modern bird feathers. Trace amounts of copper and zinc were also found in the Dinobird's bones: like birds today, the Archaeopteryx may have required those elements to stay healthy. University of Manchester palaeontologist Dr Phil Manning said: "Archaeopteryx is to palaeontology what Tutankhamen is to archaeology. It's simply one of the icons of our field. "You would think after 150 years of study, we'd know everything we need to know about this animal. But guess what—we were wrong." Lead author geochemist Dr Roy Wogelius from The University of Manchester said: "We talk about the physical link between birds and dinosaurs, and now we have found a chemical link between them. "In the fields of palaeontology and geology, people have studied bones for decades. But this whole idea of the preservation of trace metals and the chemical remains of soft tissue is quite exciting." The researchers found significantly different concentrations of elements in the fossil than in the surrounding rock, confirming they are remnants of the Dinobird and not leached from the surrounding rock into the fossil. SLAC physicist Uwe Bergmann, who led the X-ray scanning experiment, said: "People have never used a technique this sensitive on Archaeopteryx before. "Because the SSRL beam is so bright, we were able to see the teeniest chemical traces that nobody thought were there." Researcher Bob Morton said: “The discovery that certain fossils retain the detailed chemistry of the original organisms offers scientists a new avenue for learning about long-extinct creatures. As a result, say the team, the research could change the way palaeontologists work. Dr Wogelius added: "We're able to read so much more into these organisms now using this technology - we're literally touching ghosts. "Chemistry is the real key in the future of palaeontology. It's a paradigm shift." Dr Manning added: “I wouldn't be surprised if future excavations look more like CSI investigations where people look for clues at a scene of a crime. “There's info that's still there that can't be seen with the naked eye.